Here in Saskatoon, we have more than our fair share of cold weather. Along with that cold weather comes an increased likelihood of snowfall. In fact, weather experts estimate that there’s a 60% chance of snow here throughout much of December and January. Of course, snowfall varies from year to year, but the average is around 100 centimetres. With this type of weather, you need to make sure that your roof is in good condition. 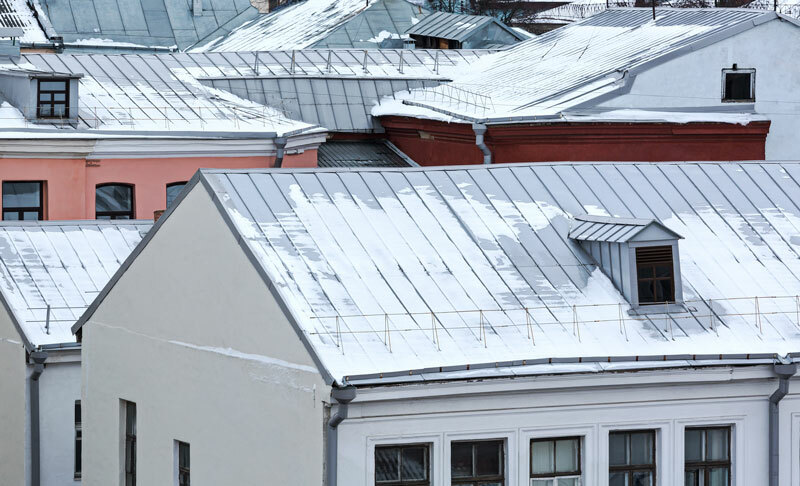 You also need to make sure you have the best type of roof for a cold climate. We recommend metal roofing for many of our customers for several reasons. Metal roofing can be more watertight than traditional roofs. Sealants can be applied to the surface and underlayments can be installed. These safeguards reduce the likelihood of leaks. The load of the snow is more evenly distributed across a metal roof. The effects of gravity are spread out and are less likely to cause a failure in any particular roof panel. You can affect the rate at which your roof thaws or sheds snow by the color you choose. Darker colors like reds, grays, and browns absorb more of the sun’s energy and heat. This helps get the snow off of your roof faster. You can control snow shed through the use of snow guards. Rails or other types of guards can be installed without puncturing the roof panels themselves, maintaining the integrity and water resistance of the roof. The guard devices will keep snow from sliding down your roof in an avalanche-like manner. Metal roofs simply last longer. Even the highest quality roofs can suffer damage from years of extreme weather conditions. In many cases, metal roofs can last at least two times longer than a traditional shingle roof. You’ll avoid having to reroof for many years to come. To learn more about metal roofing or any of our roofing services, call Cactus Roofing. We’re a trusted roofing contractor that’s served the Saskatoon, SK area for years. Contact us today for a free roofing estimate!